It was so hard to choose just a few maps from this lab, all of you did such great jobs with this assignment. I was impressed with the levels of creativity, professionalism, and overall problem solving and map making skills. Heather McPherron was able to fit a large amount of data about the campground into a single map without totally overwhelming the user (look how she fit four data frames into a single page- you can see all the information you need at each appropriate level of detail). This is a great skill, especially when trying to sell a point to someone who has no time to read through pages of information. Excellent job. Lexine Long also has an excellent map. The complimentary symbology really looks professional. Rachel Curtis had a great map last week, but I really wanted to show her map for this week's lab. Her location map(s) look super sharp. 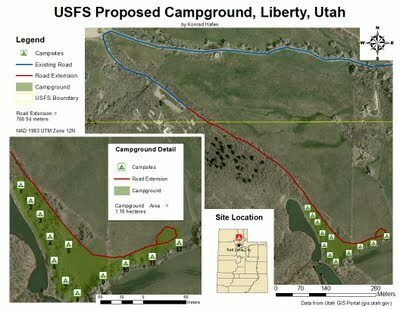 Having the clear outline of Utah with a reference to I-15 and Ogden gives a very clear representation of the campground location. The layout of the page is balanced and professional. Seneca Francis has a simply, easy to read map. Her table of campground sites and description of files were also very well done; professional, clear and easy to navigate. Check them out if you get a chance. Paul Reinhardt also has a simple, clean layout. Konrad Hafen had a really creative solution to fitting all the needed data into a single map. His location map refers the user to not only Utah, but also Salt Lake City. You can see the total road extension, but also an inset of zoomed in on the campground. Great work you guys! Keep it up!